From the beginning of 1979, domestic and international gold markets began a month-by-month rise. With no end to the enthusiasm in sight, the average price of gold on the international market rose steeply from $227 per ounce in January to $460 per ounce at the end of the same year. At the same time, the average domestic price for gold also jumped from under 1,500 yen per gram in January to 3,600 yen at the end of the year, stirring up Japan’s first gold boom. The price of gold during our first gold boom peaked on January 22, 1980 at 6,495 yen per gram. With the average price for that month being 5,285 yen per gram, this represented an increase of approximately 3.6 times the previous January’s 1,482 yen. Next followed a sharp decline in the price of gold, bringing the curtain down on about one year of dramatic increases. During this time though, the mass media was busy reporting on the many wild fluctuations in the international markets, so day after day TANAKA was inundated with customers. Our retail shops were full of customers; those coming to sell at a high price the gold they had purchased at a low price and those coming to buy gold under the belief that the price of gold would continue to rise. There were customers waiting hours to be served and even customers who eventually traded their gold directly between themselves. Customers selling gold were fine, but some of those buying were worried about whether it was the genuine article, coming back to our shops days later to confirm its authenticity. Our public relations department at the time was inundated with inquiries, with as many as 1,800 telephone calls being received on some days. Fourth-generation president Tadahiko Fukami was being chased by the media for an interview, but because he understood the value of information collection, he spent every day in the telephone consultation room talking to normal customers. In Japan at present, a number of gold bullion coins are sold for investment purposes, including the Vienna Philharmonic coins from Austria and the Maple Leaf coins from Canada. Unlike commemorative gold coins, the price of these coins varies daily along with the price of gold. In any case, new releases occur on a regular basis in anticipation of Japan’s purchasing power as an affluent country. The first gold bullion coins to arrive in Japan were the Krugerrand gold coins released in 1980. With an excellent coin design, the manager of Far East marketing for South Africa’s International Gold Corporation (InterGold), representing the world’s largest gold mining country, wanted to start selling gold coins in Japan so he came to us for advice the year before the release of the coins here. At the time, the Krugerrand could boast the largest gold coin volumes issued in the world, with the majority of purchasers in Europe and the US, but InterGold wanted to expand its market into Far East countries. However, this was the year after gold transactions were deregulated in Japan, and excise duty was a high 15% (where retail price was 25,000 yen or higher), so even though they wanted to sell in Japan, it was completely unknown whether the population would accept it as a mass market product. Now well established, TANAKA Kikinzoku Jewelry was founded in 1892 as our outlet for precious metals jewelry. The company originally started business in Asakusa as Shimizu Shoten, a retailer of precious metals accessories. When Kamekichi Yamazaki took over management, the name changed to Yamazaki Shoten for a while and the company moved to its current location in Ginza. Mr. Yamazaki left his mark on history as a pioneer in the world of precious metals, being the first person in Japan to draft rules for clarifying the K18 (18 karat gold) and K24 (24 karat gold) system of assuring the purity of gold, and therefore improving trust in and quality of precious metals in general. 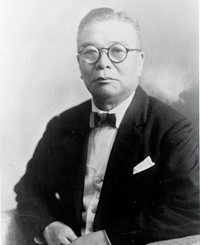 In addition, he established a company called Shokosha Watch Research Institute (now called Citizen) to manufacture the first pocket watch in Japan. In 1928, then Emperor Hirohito purchased one of these watches, apparently later commenting at the army maneuvers that, "At Yamazaki's, they make wonderful watches right here in Japan." Later being elected as a member of the House of Peers, Mr. Yamazaki became a leading figure in the world of precious metals, however he began pouring his money into politics and his business suffered as a result. In 1930, TANAKA Shoten took over the business from Mr. Yamazaki and carried on his legacy.